"Of course, clothing fashions have always been impractical, except in Tahiti." A hobble skirt (from to hobble = "to limp") is a skirt with a narrow enough hem to significantly impede the wearer's stride, thus earning its name. 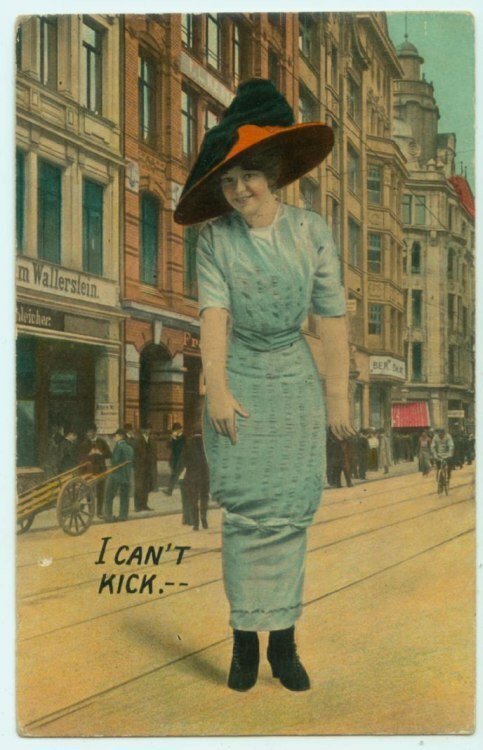 The restrictive garment's popularity increased by 1910, the same year the 100-yard hobble skirt championship of Greater New York (and yes, this really happened) took place. 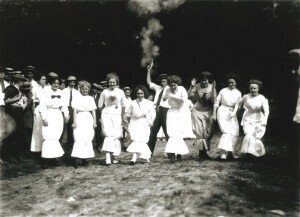 On September 14, 1910, The Milwaukee Sentinel reported on the race, in which Sarah King was crowned hobble skirt champion. "The program announced to wouldbe contestants that 'women desiring to enter who were not equipped with hobble skirts will be hobbled with ropes until they are fully as uncomfortable as if dressed in the height of fashion.' The winner covered the 100 yards with only seven tumbles." It was incredibly difficult for women to maneuver around cities while taking geisha-like steps in these skirts, which led to countless fashion-related accidents. It soon became apparent that something had to change by way of public transit to accommodate the bound-up women. On March 21, 1912, The Toledo News-Bee published an article titled "Hobble Skirt Wins Lower Car Steps" about the Washington St. Railway Company placing orders for new streetcars that would cater to the impractical trend by making the step up into the car a meager 8 inches from the ground. For obvious reasons, these new streetcars were dubbed "hobble skirt" cars. In 1913, the Boston Evening Transcript reported that a London fashion expert that had just returned from Paris said, "The skirts I saw in Paris were so tight that the wearers could scarcely walk. The dresses are frightfully ugly." Not long after this article was published, skirt designs started to become a bit more functional. But the question still remains: why would anyone with any sense wear the impeding hobble skirt? Perhaps women of that decade believed it made them more ladylike (apart from the tripping and falling) to make small steps or, just simply, flattering to the figure. Whatever the reason, just as high heels are a girl's best friend, fashion and comfort do not always coincide. I purchased a black and white checked jersey from Mood and decided to sew a pencil skirt. To prevent it from looking too basic, I wanted to add an eye-catching detail at the waistline. I found a small glass bowl in my kitchen and traced around it to make an interesting design. 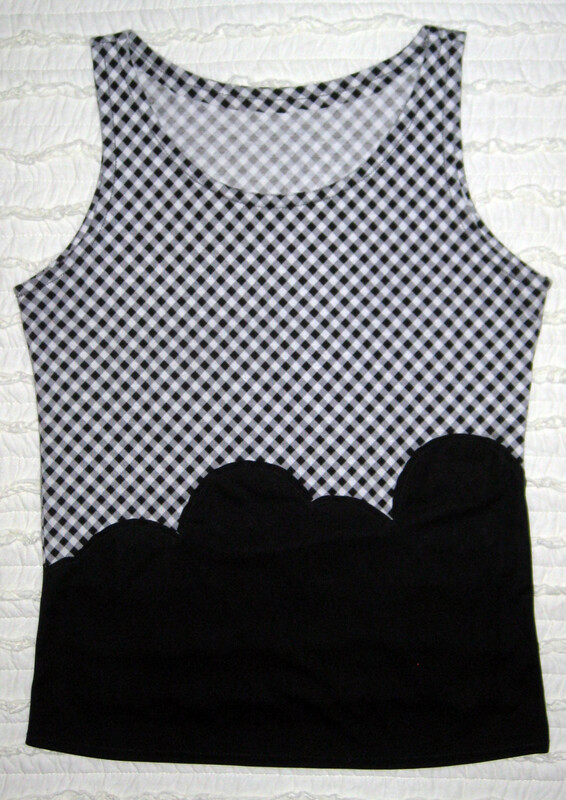 I had leftover checked jersey, so I also created a top similar to my skirt design. 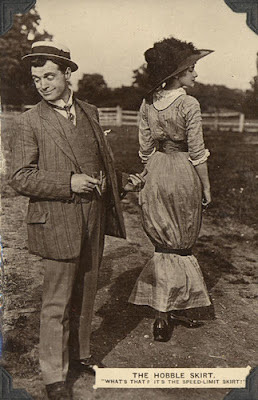 Fortunately for me, my modern and shortened version of the hobble skirt is a bit easier to walk in than the ones worn by the fashion-forward ladies of the early 1900s.